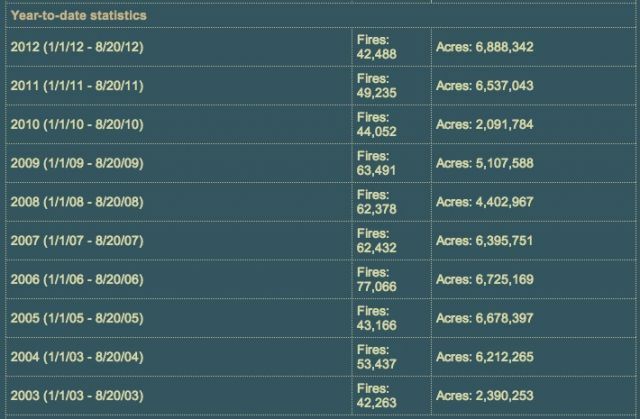 Wildfire smoke: Dan Pearce via FlickrThe National Interagency Fire Center reports that 2012 just broke the record for most acreage burned by wildfires as of this date (see chart below). The previous record was set in 2006, another mega-drought year. That’s nearly 7 million acres—or 10,893 square miles—that have burned so far this record hot and dry year. Currently 39 large fires and fire complexes are actively burning 1,401,968 acres. 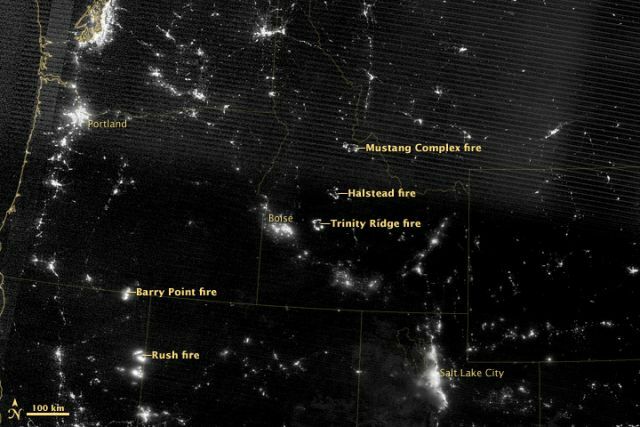 Night view of western wildfires, August 17 NASA image by Jesse Allen, using Suomi NPP VIIRS dataIn Northern California, where I live, fire bloomed with August’s dry lightning strikes. Since even the biggest lightning-sparked fire starts out as something small, maybe just a single smoldering tree, sometimes someone finds that tree in time. Then came the report of a lightning fire burning in rugged terrain southeast of Eagle Lake. The fire had been spotted from the summit, but at night no aircraft could be used for reconnaissance and there were no direct roads into the forested area. So in the dark, with a flashlight and a radio, this one guy went off hiking into the woods to find a fire. We all sat listening to the radio and wondered out loud—what do they call him? Is there actually a name for this job? Is he a ‘smoke-hiker’ or ‘fire-walker’? All we knew for sure is that in the dark of the night this guy had set off on his own through some of the most intimidating wilderness in the county searching for a fire, walking through woods that aren’t easy-going in the daytime, in conditions where smoke filled the air, and made visibility almost zero… [A]fter two hours of hiking in the dark smoky night through road-less forest, our hero found it… a single pine tree burning in heavy undergrowth which in itself was on fire in every direction for 50 to 100 yards… Our ‘smoke-walker’ then began the almost 1-hour trek back out from the fire to meet the crew, turned around and guided them back to the fire as quickly as possible. Wildfires have big costs. 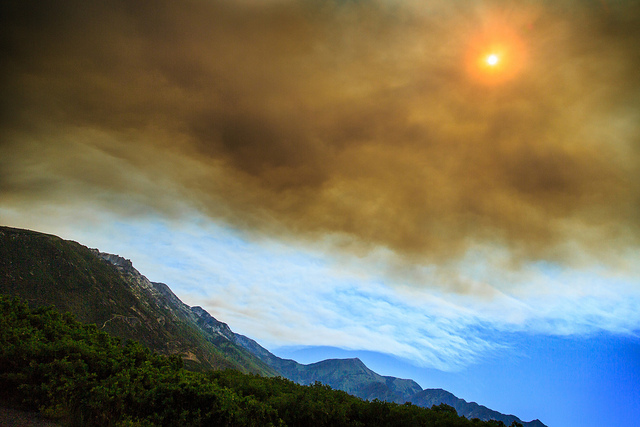 So far in Utah this year there have been more than 1,000 wildfires that have cost over $50 million to fight. The Chips Fire in Northern California—at just shy of than 50,000 acres—has a running tab of over $17 million as of six days ago and it’s still going strong. Wildfires also have intimate costs. Like the “fire-walker’s” solo journey into the night. And tragic costs. Like the 20-year-old firefighter on the Steep Corner Fire in Idaho who died when a tree fell on her on August 12. Or the inmate-firefighter who died fighting the Buck Fire in Southern California on Sunday. Plus the global costs. As Jeff Masters writes, a recent study suggests that while 8 percent of Earth should see decreases in fire activity over the next 30 years of global warming, 38 percent should see increases. And then there are the personal costs. In my case, newly diagnosed with asthma, that means learning to live with canaries—I mean, bronchi—in my chest, letting me know with crazy sensitivity just how much particulate is in my little portion of the atmosphere. Suddenly fire and smoke maps like the one above are interactive in a whole new way.